William Penn are some of the best machine-made cigars you will come across. Made using natural tobacco leaf fillers, and sporting homogenized tobacco leaf binders. The wrappers are made from homogenized tobacco leaves as well. 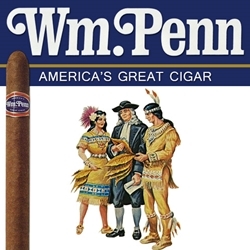 This unique blend results in William Penn machine made cigars being mild-bodied and thus being the perfect cigars for beginners and those accustomed to cigar smoking alike. Featuring an enticing aroma, smooth draw, even burn and amazing consistency provide an unmatched smoking experience from William Penn. Whatever the occasion can be, cigar enthusiasts everywhere love William Penn machine made cigars. Great after dinner smokes that are beautifully crafted to satisfy the desire to sit back and enjoy a relaxing good time. Smokers Discounts has made it easy and affordable to buy machine made cigars online. Call us for more details!